Hello, OOAK bear collectors and fans of bear. 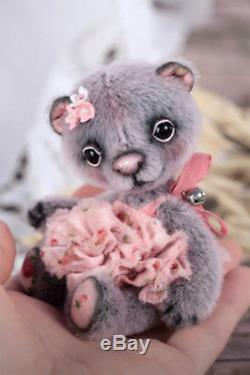 Please, for your attention this is miniature ooak bear Iness - strawberry ballerina by very popular artist Anna Tide from Germany. This bear from my pesonal collection, all the time was stored under glass only and his condition very perfect , like fresh-made from artist. She was sewn from smokey long pile, has black glass eyes with sculpted eyelids and nose. She is 10 cm tall, is fully cotter pin jointed, has a wobble-head and stuffed with polyfill with stell beads for stability and nice weight. Feel free to ask any question thanks for watching. The item "Teddy bear one of a kind artist mini handmade teddy, collectible toy, 10,5 cm" is in sale since Tuesday, January 23, 2018. This item is in the category "Dolls & Bears\Bears\Artist\One of a Kind". The seller is "kykycik" and is located in Brooklyn, New York. This item can be shipped to United States.